It’s that time of year once again, when the city empties, the traffic on the highways is a nightmare, and Cambodians everywhere celebrate a time for family, food and faith. 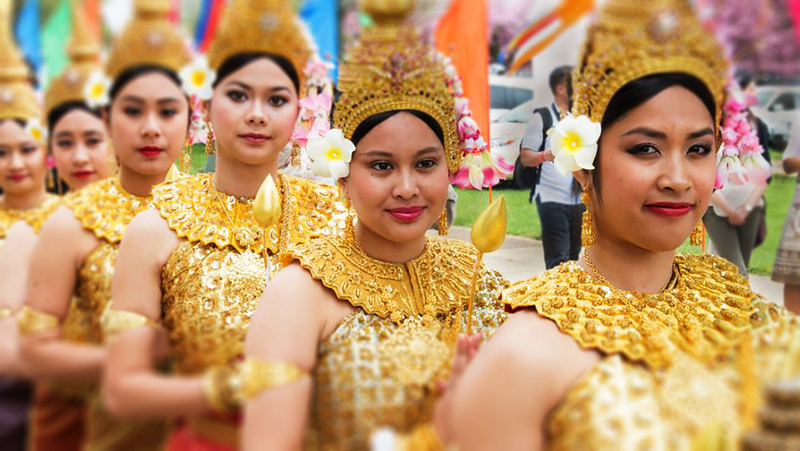 While most people flock to their home provinces, escape the country, or find a nice beach to go lie on, we’ve got you covered for what’s going on around the city this Khmer New Year and how to make the most of the peace and quiet. Power cuts getting you down? Worried they’ll just turn off the grid thinking no one’s going to be in the city anyway? Booking yourself in to a swanky hotel for your time in town will get you in the right mood to meditate or veg out like the mashed potato you are. Just make sure the hotel has its own generator. Best of all, most hotels offer Khmer New Year discounts, so you can focus your wallet’s attention on the bar tab rather than the room fee. Last year I stayed in the amazing Iroha Garden Hotel and Resort, tucked away in Little Tokyo. Looking like something out of a Wes Anderson film, this old 60’s Khmer Villa has been lovingly restored to suit your chill out needs, with a huge pool in front of a grass lawn (grass!) to help you bliss out. While the official new year doesn’t start until the 14th, there’s always a bit of leeway with these holidays, so start it off right this Saturday and stock up on some reading material for you to peruse while you laze by a pool, head over to Flicks Community Theater from midday for the Phnom Penh Book Exchange, with over 500 titles you can hoard in the hope your social media consumed brain will be able to summon the attention span to get around to actually reading. Later on, head over and say goodbye to DJ Weatherlake at his farewell party at Bong the Gallery, as they celebrate his path to new adventures with some cool beats from 7pm. Or if you’re feeling like something moody head over to Alchemy for their Jazz Manouche Nights Series, featuring Hot Club de Phnom Penh lead by the glamorous vocals of Intan and backed by her signature musicians, violinist Nono Mac Kay, guitarist Sebastien Adnot to combine a mix of musical influences. Start your new year off right with a big fat greek brunch at Chinese House from 11am where you can indulge in some true Mediterranean flavors, accompanied with fabulous wines by Alpha Estate. $18 per person gets you all you can eat, while $33 gets you free flow sparkling. It’s the holidays after all! Afterwards, if you want to purge some of the dirty thoughts that have been swirling around your head, make your way over to The Vine at 1pm for their Cards Against Humanity Contest, where teams will duke it out for the title of dirtiest minds in town plus a $20 bar tab, check out the event page for the ground rules. If you feel like keeping active during the holiday, head over to Phnom Penh Climb Community Gym at 6:15pm for their Easy Monday Run, an easy pace, short distance run exploring the neighborhoods and alleys of Phnom Penh. Meanwhile, it’s the night that nerds across the city have been waiting for: the premiere of the first episode of the final season of Game of Thrones! Flicks will be holding multiple sessions of the premier at 6:30pm, 8pm and 9:30pm, while uptown’s The Empire and midtown’s The Box Office are also holding sessions. Bookings ahead of time is recommended, dragons, swords and direwolfs aren’t allowed, and no spoiler talk at the venue after the screening or you will be burnt, beheaded and baked into a pie. On the final official day of the new year things in town are sleepy, but if you want to fill the empty streets with music why not head over to Masamune for their weekly Ukulele Circle at 7:30pm. Or if you’re in the mood for a giggle, head to Mad Monkey at 8:30pm where you can see Sam Thomas do his best to entertain the bored backpackers with Volunteer Comedian. Your one $1 entry fee goes to the Cambodian Childrens Fund. Aaaaand that’s all from us! សួស្តីឆ្នាំថ្មី (sua s’day ch’nam t’mai)… see you in the New Year! We roundup the best of the weekend ahead! We chat to the director and lead actors of Phnom Penh Players' new musical.